Gardening can be one of the toughest jobs you'll do all year. 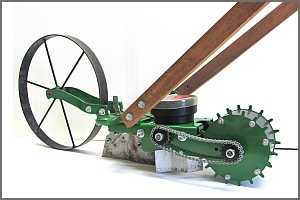 That's why new inventions, like the one we tried in our Hoss Wheel Hoe review, is so exciting! Working in the garden is practically a full-time job, and that's with the help of my husband, myself, and all 6 of the kids! Our soil is clay -- "gumbo" as it's called here near the river bottom -- which means that it gets dense, packed down, and very sticky when wet. We have a great tiller that we use to initially break up the soil, but we were looking for something manual, yet durable, that we could use to dig rows, tend to weeds, and even plant, when needed. We ordered the Deluxe HOSS Double Wheel Hoe, and anxiously awaited the garden season to start! The hoe did a very good job of keeping things straight, and was able to work through any rocks or roots that were remaining. It was still work -- kids under 10 would have a hard time pushing through our dirt -- but it definitely made it easier than using a typical hoe. The double-wheeled model kept things on track and gave us some stability when working over bumpy areas. Several accessories come with this deluxe model. (It includes a pair of weeding blades and 4 cultivator teeth and it also includes the shorter axle for converting back to single wheel version.) We, unfortunately, were unable to use the weeding blades on too much of the garden, due to issue here on the farm. The areas that we could use the weeding blades look FANTASTIC! No weeds between rows, which is probably why our yield on our green beans has been so high. I'm also looking forward to seeing how our potatoes (which were also weeded with the hoe and blades) will do this year. It was certainly easier than pulling large weeds by hand later in the season. We also invested in a seeder attachment. It was designed to keep us from stooping down and hand-seeding everything (or mess around with homemade seed tape, plus it is set up to evenly space the seeds. We had a little difficulty setting this up at first. In fact, my husband was convinced that it wasn't seeding at all -- until we found 2 incomplete rows of green beans mixed in with our tomatoes a week later. It turns out that is did an amazing job of planting and spacing the seeds; we just didn't realize how the dirt would lay over the seeds after we passed through. I think we will definitely master this accessory for next year. Our first time was a bit of a learning curve, and we would test it on the sidewalk (like they said in the directions.) Our eagerness to get the seeds into the ground clouded our judgement to work on our art. Overall, were happy campers with the money we spent to do the Hoss Wheel Hoe review. (Sample was NOT provided.) It's something that we have used every season since we first gave it a try in 2013! Even with hard wear and tear, it's in great condition and clean up nicely. You get what you pay for with this premium, high-quality implement for home gardeners. The HOSS Wheel Hoe comes in a variety of models, and there is about every accessory you could need for your garden. It's a solid investment that I'm glad we made. For the serious gardener, homesteader, or small hobby farmer, it's perhaps the only way we've found to manage the in-ground garden. While we'll continue to use raised beds for about half of our harvest, this makes the ground tending much easier on our backs and gives us some motivation to keep up on the day-to-day of garden maintenance. You can find the entire line of products mentioned in our HOSS Wheel Hoe review here.